R2019-01 01/16/2019 Approved MFT Authorization for 2019 General Maintenance Projects. R2019-02 01/16/2019 Approved Entering an Agreement of Understanding with the Illinois Department of Transportation (IDOT) for Maintenance and Construction. R2019-03 01/16/2019 Approved Approval of an Engineering Agreement for Johnson Road Box Culvert Rehabilitation in Mayfield Road District. R2019-04 01/16/2019 Approved Selecting DeKalb County Convention & Visitors Bureau as the County’s Agency of Record for Tourism Promotions. R2019-05 01/16/2019 Approved Approval of a Loan to the Voluntary Action Center. R2019-06 01/16/2019 Approved Approval of Community Action Transition. R2019-07 02/20/2019 Approved Approval of a Local Agency Agreement for Barber Greene Road Safety Shoulders. R2019-08 02/20/2019 Approved Purchase Award for One New Tandem Cab and Chassis. R2019-09 02/20/2019 Approved Award of Peace Road Aggregate Base for Right Turn Lanes at Brickville and Freed Roads. R2019-10 02/20/2019 Approved Authorizing the Execution and Amendment of a Federal 5311 Grant Agreement. R2019-11 02/20/2019 Approved Authorizing the Execution and Amendment of a Downstate Operating Assistance Grant Agreement. R2019-12 02/20/2019 Approved Abating the Entire Property Tax Levy for the 2018 Tax Year for the 2010 Courthouse Expansion and Jail Expansion Bond Issue. R2019-13 02/20/2019 Approved Abating the Entire Property Tax Levy for the 2018 Tax Year for the 2017 Jail Expansion Bond Issue. R2019-14 03/20/2019 Approved Award Resolution for 2019 General County Letting. R2019-15 03/20/2019 Approved Award Resolution for 2019 Road District Crack Route and Fill Project. R2019-16 03/20/2019 Approved Award Resolution for 2019 Drainage Pipes. R2019-17 03/20/2019 Approved Award Resolution for a New Box, Plow, Wing, Spreader and Pre-wet Tank. R2019-18 03/20/2019 Approved Illinois Municipal Retirement Fund (IMRF) Investment Rate of Return Assumption. R2019-19 03/20/2019 Approved Engineering Agreement for South First Street Box Culvert Replacement at Gurler Road. R2019-20 03/20/2019 Approved Engineering Agreement for Motel Road Bridge Replacement .5 Miles North of Illinois Route 64. R2019-21 03/20/2019 Approved A Resolution Approving Unexpected and Emergency Appropriations and Budget Transfers for the Fiscal Year Ending December 31, 2018. R2019-22 03/20/2019 Approved Approval of Easements for the DeKalb County Rehab & Nursing Center Expansion Project. R2019-23 04/17/2019 Approved Approval of Local Agency Agreement for Peace Road / Illinois Route 64 Intersection Improvements. R2019-24 04/17/2019 Approved Approval of Local Agency Agreement for the Plank Road Safety Project from Lindgren Road to the Kane County Line. R2019-25 04/17/2019 Approved Approval of Local Agency Agreement for Base Line Road Bridge Replacement. R2019-26 04/17/2019 Approved Anticipation of Township Bridge Funds for West Motel Road Bridge. R2019-27 014/17/2019 Approved Award Resolution for Approval of 2019 Hot-Mix Resurfacing Projects. R2019-28 04/07/2019 Approved Award Resolution for the 2019 Seal Coat and Rejuvenator Projects. R2019-29 04/17/2019 Approved Award Resolution for the 2019 Road District Aggregate Projects. R2019-30 04/17/2019 Approved Award Resolution for the 2019 Pavement Marking Project. R2019-31 04/17/2019 Approved Authorizing the Execution and Amendment of a Section 5311 Grant Agreement for Fiscal Year 2020. R2019-32 04/17/2019 Approved Acceptance of the Special Warranty as a Condition to Receive Section 5311 Funds for Fiscal Year 2020. R2019-33 04/17/2019 Approved Award of the Senior Services Tax Levy Funding. 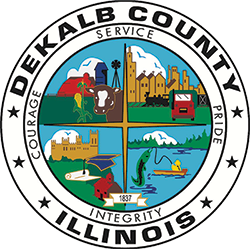 R2019-34 04/17/2019 Approved A Resolution Certifying Illinois Municipal Retirement Fund (IMRF) Participation for Qualified Elected Officials of DeKalb County Government.